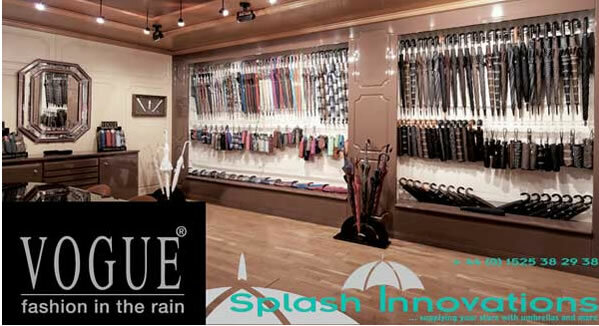 Splash Innovations is a designer, importer, manufacturer, wholesaler and distributor of many hundreds of different umbrellas and parasols. As exclusive distributor of VOGUE fashion and designer umbrellas we offer many of these stunning umbrellas on our standard lead time from our UK warehouse. Any enquiries, please contact us at postroom@splashinnovations.com or phone 01525 382938 (or if calling from outside the UK, telephone +44 1525 382938).